A Stones Throw in Whitby, Yorkshire sleeps 5 people. 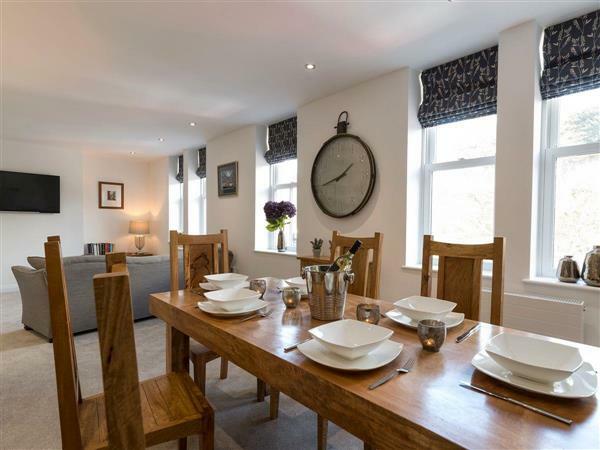 A Stone’s Throw in Whitby is an apartment which forms part of a stunning redevelopment of one of Whitby’s most iconic Victorian houses, providing everything you need for your perfect holiday stay. Enjoying a magnificent first floor position overlooking beautiful Pannett Park with its extensive children’s play area literally on your doorstep. Ideal for couples and families alike, A Stone’s Throw is the perfect location for romantic getaways, family seaside adventures or catching up with friends, while walkers of all ages and abilities will enjoy the breathtaking scenery of the nearby Dinosaur Coast Path. The delights of Whitby, only a gentle 5-minute stroll away, are certain to entice you down to the harbour. Enjoy a boat trip followed by some well-earned refreshments at one of the many harbour side pubs or cafés, then wander the quaint cobbled streets to the famous 199 abbey steps and beaches beyond. You’ll be spoilt for choice from the huge variety of places to eat throughout the day and into the evening, all within easy walking distance of the apartment. Award-winning restaurants and bistros, world famous fish and chips, plus cosy pubs and buzzing new bars means there’s something to suit everyone’s appetite, budget and holiday style. Whitby’s local shops cater for all your holiday needs, including excellent butchers and fishmongers if you’re tempted to relax at home for the evening or why not treat yourself to a picnic in the park? A Stone’s Throw offers relaxing, comfortable accommodation whatever time of the year you choose to visit. Furnished to a good standard the owners have provided excellent facilities to create a genuine ’home from home’ experience to ensure you’ll get the very best from your stay including Wi-Fi to make Facebook friends and Twitter followers jealous of your holiday adventures. There’s a smart TV in the living area with free OnDemand and Netflix accounts, and TVs in both double bedrooms for those lazy holiday mornings and breakfasts in bed. The beach is 750 yards from A Stones Throw in Whitby. With the shop, pub and restaurant 500 yards from A Stones Throw. A Stones Throw is all on the first floor. Living area: With 40 Freeview Smart TV with Netflix, and Bluetooth speaker. Gas central heating, electricity, bed linen, towels and Wi-Fi included. Travel cot and highchair. On road parking. No smoking. Holidays at A Stones Throw run from Friday to Friday. For a better idea of where A Stones Throw is, you can see A Stones Throw on the map below. A Stones Throw is in North Yorkshire; should you be on the lookout for a special offer, you can find all the special offers in North Yorkshire. It's always worth checking to see what is on offer at the moment. Do you want to holiday near A Stones Throw (UK2391), you can see other cottages within 25 miles of A Stones Throw; have a look to find your perfect holiday location.